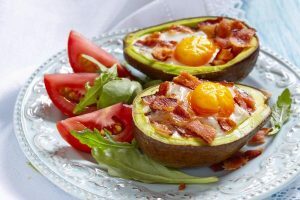 The keto diet has received a great deal of press, for good reason. Its counterintuitive approach of including high-fat content suggests it should lead to weight gain, not weight loss. The theory behind it and similar diets is that a high-fat content (of good fats!) and drastically low carbohydrates can throw the body into a process called ketosis. Ketosis is a metabolic process where the body is very efficient at burning fat, by converting fat into ketones in the liver. Ketones in turn supply energy to the body, including the brain. Our bodies typically use glucose for energy. However, after prolonged exercise, or fasting, or while on a high-fat, low-carb diet, the body can’t get enough glucose, so it switches to retrieving energy from fat. Fat gets broken down into ketones, which then serve as energy. So, ketones are to fat what glucose is to carbohydrates: the product the body can use for fuel. Elevated levels of ketones have several beneficial side effects. Blood pressure goes down. Blood sugar and insulin levels drop. And perhaps most important, the body burns its fat reserves. The keto diet can dramatically affect insulin and blood sugar levels. If you are at any stage of diabetes, the keto diet may be problematic. This diet can give your kidneys and liver a workout — the liver in particular because it is the liver that breaks fats down into ketones. If you suffer from any problem relating to your liver or kidneys, avoid the keto diet. Fats are harder to digest than other types of foods, so if you lack a gallbladder, avoid it. Your body may face a great deal of strain if you subject it to the high fats of the keto diet without a gallbladder to process them. If you’re being medicated for high blood pressure, the keto diet may not be right for you unless you and your doctor are willing to carefully monitor your blood pressure frequently in the first few weeks of the dietary change. A ketogenic diet can cause blood pressure lowering very quickly, and unless you’re paying attention, you may get “too healthy” for your dose of medication very quickly, causing you to feel weak, tired or dizzy as your medication lowers your blood pressure too far. It’s likely that your medication will have to be lowered or stopped very soon once you start eating keto, so make sure your doctor knows about the diet change and that you’re both keeping track of your blood pressure. Choosing to eat extreme low-carb keto isn’t the right choice while you’re breastfeeding, as there are been a few rare cases where that caused health issues. Strict low-carb diets aren’t an ideal choice at this time. A more moderate approach with at least 50 grams of carbohydrate per day is recommended until your baby is weaned. I’m Considering The Keto Diet. Now What? If you have no health issues and you’ve cleared it with your doctor, then you may be ready to try the keto diet. Remember, any successful diet necessarily involves changes to lifestyle. Don’t expect to simply go on the keto diet for a few weeks to lose weight. Rather, shift your lifestyle to include healthy eating within the framework of the diet. This can mean altering your grocery-buying habits, your snacking habits, and your exercise habits. Research shows it can take up to a month to break or establish a habit. Now is the time to lay the ground work for your new lifestyle. In the second part of this series, we will look at foods that can be included in the keto diet.